Demians is Nicolas Chapel, and the state of progressive rock in the modern era could not be in better hands. Steve Wilson of Porcupine Tree comments: Building An Empire is 'one of the most assured and accomplished debut albums I�ve ever heard, the textures and dynamics within the music are breathtaking. A must for everyone that appreciates the art of epic and ambitious 21st century rock music.' High praise, indeed. 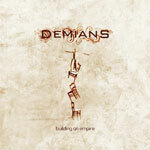 Demians's Building An Empire is an inspired and ambitious work of modern and progressive rock. There is no question that Chapel is a proficient musician and a talented composer. Building An Empire is deep with layers of keyboards, synthesizers, sampling, acoustic and electric guitars (with little or no guitar solos, however), and drumming. Most every song is built upon a lush symphonic base. Upon this Chapel brings other instruments on board to convey a variety of musical styles: symphonic rock on 'The Perfect Symmetry,' movements of melodic hard rock on 'Shine' or 'Naive,' and even some power/prog metal at the end of 'Sapphire.' Chapel is best when he blends these styles and varies tempos for more a more progressive rock composition. This is done eloquently on 'The Perfect Symmetry,' Sapphire,' 'Naive,' and to a lesser extent on 'Sand.' Ultimately, the whole album is blessed with Chapel's rich vocal arrangements that ebb and flow like ocean waves on a moon lit night. If you haven't noticed, I have really emphasized only three songs which appear in the first half of Building An Empire. From 'Unspoken' to the end, this work shows little variation. The compositions are softer, the tone melancholy, and the over all sound as modern rock. The songs emphasize the lead vocals and vocal arrangement which are built on upon a foundation of piano and airy, symphonic keyboards. The songs are not dull just predictable to the point redundancy. The exception is the longest piece 'Sand' which has all of the preceding in the first half, then some rather fast and heavy symphonic prog metal for several minutes, and finally a return to the first with only some up tempo drumming to brighten. With Nicolas Chapel and Demians's impressive and creative debut Building An Empire, modern progressive rock is excellent health with a promising future. Building An Empire traverses many musical styles to create inviting songs of intriguing complexity and melancholy mood. Highly recommended! With Nicolas Chapel and Demians's impressive and creative debut Building An Empire, modern progressive rock is excellent health with a promising future. Building An Empire traverses many musical styles to create inviting songs of intriguing complexity and melancholy mood.